I know I say this a lot - but this is one of my favorite meals to make. Hahah I’m serious! This dish came about a year or so ago out of my sheer craving for a tomato-based chicken entree. Braising is an easy cooking method that uses both dry and moist heat. Food is typically seared at a high temp, and then finished in a covered pot/pan at a lower temp while simmering in some type of liquid. It’s obviously often used for pot roast and spare ribs, to name a few yummy options. My mind pictured a tender, fall-off-the-bone chicken thigh, seared and then cooked gently in a delicious tomato basil sauce. Crimini mushrooms hold up nicely in liquid, and the addition of fresh spinach is perfect to round out this dish. I’ve been a little apprehensive about posting this recipe because I cheat and use one of my favorite bottled sauces from TJ’s, their Tomato Basil sauce. I know that some people are super anti pre-made sauce, but honestly, it’s budget-friendly ($1.99/bottle), delicious, and makes this meal easy to throw together on a weeknight when time is so important. You can of course, substitute your own favorite homemade tomato sauce, but I am stickin to my guns - I love the TJ’s Tomato Basil. Mince 2 cloves of garlic. Quarter the mushrooms and chop 1/2 a yellow onion into ribbons. Chop 1 tomato into 1” pieces. Season chicken, skin side up, generously with salt, pep, and garlic powder. In a skillet over medium heat, drizzle 1 tbsp extra virgin olive oil. Add onions and mushrooms, seasoning with salt and pep. Add garlic and sauté this mixture until translucent. 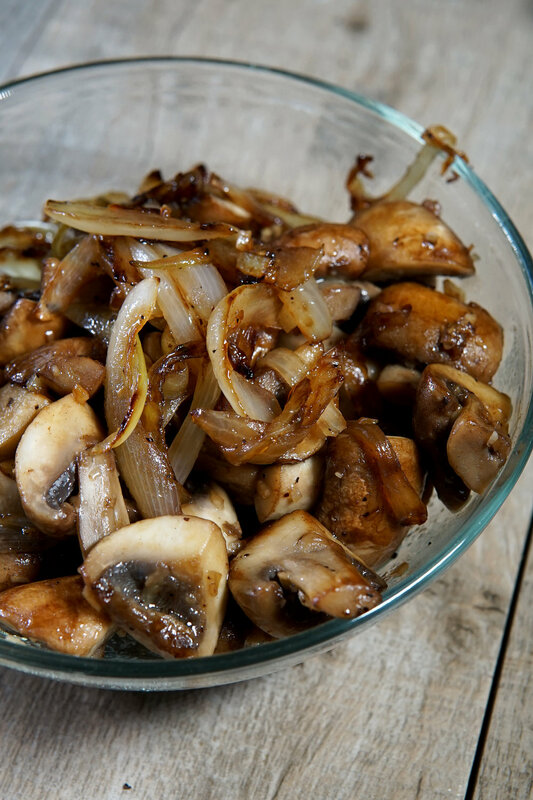 Remove sautéed onions and mushrooms from the pan and place aside. In a separate saucepan, bring 3 cups of broth to a gentle boil. Once boiling, stir in 1 cup polenta and season with salt. Cover, but stir often, and cook for 5 minutes. Keep warm. If it seizes up while you cook the chicken, it can be rewarmed with more broth. 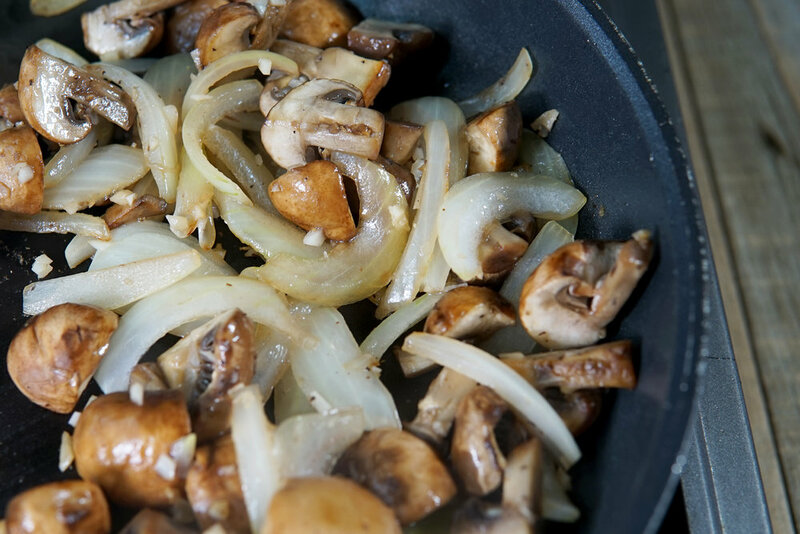 In the skillet you cooked the onions and mushrooms in, drizzle some evoo over medium-high heat. Sear the chicken, skin side down until crispy and golden brown. Do not flip the chicken! We just want some crusty goodness. Season the side of the chicken that is facing upwards. Once the skin is crispy, remove the chicken from the pan and give the pan a quick rinse. 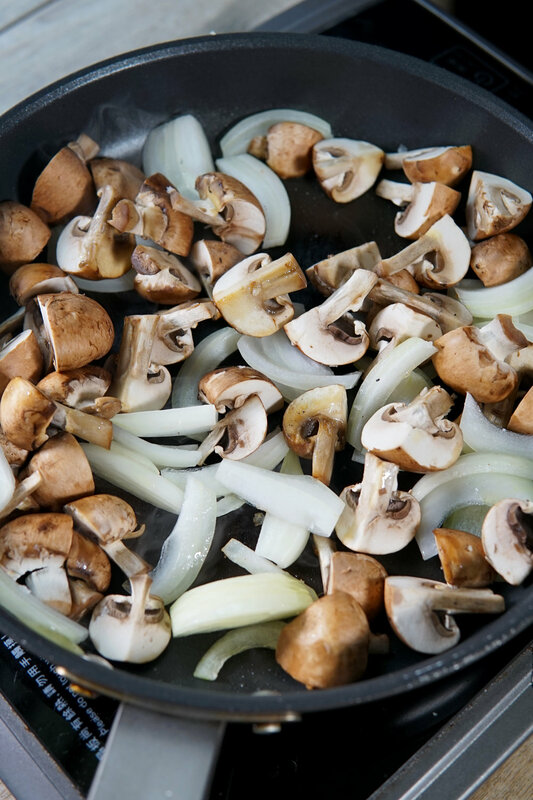 Return the pan to medium heat, combining your favorite tomato sauce, chopped tomatoes, handfuls of raw spinach, and the sautéed mushrooms and onions. Nestle the chicken back into the pan, and use a meat thermometer to monitor the chicken. Cook low and slow at a gentle simmer until the chicken’s internal temp reaches 165F. Taste for seasoning. Serve over polenta with chopped parsley. So easy and delicious. I like to cook off a large batch of chicken and keep it for the week. It’s great for bringing to work for lunch, and you can switch it up by serving it over pasta, quinoa, zucchini noodles…the options are endless! Thanks so much for reading, have a great week! !